Artists and oral historians John Campbell and Moira Kenny also known as The Sound Agents have created a digital archive of oral histories and family photographs during a year – long project funded by Heritage Lottery Fund. John explains “Liverpool Chinatown Oral History focussed on three themes: The Blue Funnel Sailors, The Forced Chinese Repatriation and the Liverpool Chinese children who took part in the Hollywood film The Inn of Sixth Happiness starring Ingrid Bergman in 1958 based on the missionary Gladys Alyward who at one time was based in Nelson Street. Gladys went to China and saved hundreds of Chinese children from a Japanese invasion. 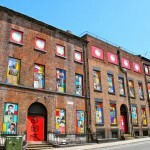 The Sound Agents are aiming to set up a living Museum in Nelson Street in the Nook Pub to create a base for people to pop in to Chinatown and tell their story adding to the archive of the oldest Chinese community in Europe. 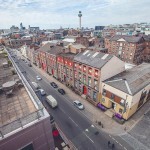 The three terraces in Duke Street have been derelict for many years, a perfect blank canvas to tell the story of the Chinese sailors and their families in the heart of Chinatown next door to the Wah Sing Chinese School. A photograph of Grace Liu in a beautiful operatic costume stands centre stage, “Grace performs internationally with the Cantonese Opera”. 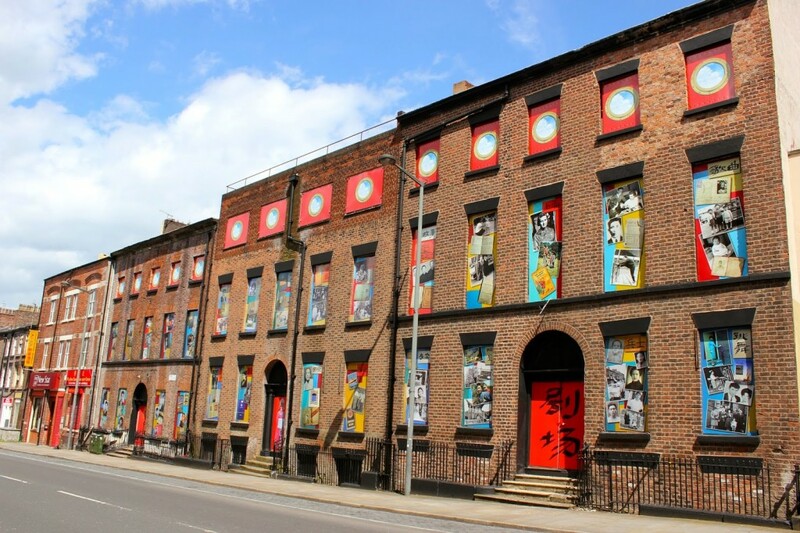 Moira tells us “We are aiming to write an opera based on the art work on the buildings, we are in talks with the Cantonese Opera to bring the group over to Liverpool next year for a special performance. First stop though is to create an App for people to access the stories and music behind the images. An educational tool that will take you beyond Duke Street to Shanghai, Hong Kong and Hollywood”! 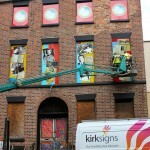 The Arts Duo have worked with Jim Kenny, Individual Graphic Design, Moira’s brother on the designs for the building. “We run a tight ship the three of us working together on deadlines” Mr Sing Zhay Woo is 90 years old on 8th June he is one of a handful of surviving Shanghai sailors who came to Liverpool during or just after WW2. “We are so lucky as they all live in Liverpool and have told us stories about their time working deep sea and coasting around Europe. I suppose we could say Opera for Chinatown is an early birthday present for Mr Woo” Mr C.K.Cheung Headmaster of the Wah Sing provided the Calligraphy for the art work. 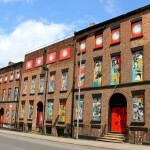 “We’re really pleased to support this Duke Street artwork as an IFB Cultural Commission. 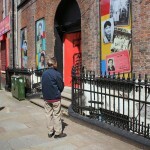 It tells a significant story in a beautiful way and really improves the look of the area. Many local people have been involved in the research, and many more residents and visitors will enjoy the finished work”. 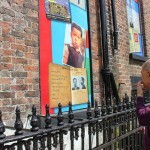 ” I cannot tell you how happy I was to see my dad’s documents on display and photographs of my Mum and Dad, Aunty Em, Uncle Wong and other family members on the wall for all to see”.